Digital tomosynthesis is a technique of generating images of slices through the body using a general radiographic X-ray system with a direct digital radiography detector. This is accomplished by obtaining a large, representative number of low-dose acquisitions across a range of projection angles of the X-ray tube. Currently, tomosynthesis is an optional add-on for suitable direct digital radiographic systems (flat panel detectors). The additional software controls the movement of the X-ray tube and the reconstruction of the images. The primary interest in tomosynthesis is in breast imaging, as an extension to mammography, where it may offer better detection rates with little extra increase in radiation exposure. Tomosynthesis can be also used in place of a number of other radiographic imaging techniques. Studies have been undertaken for a range of clinical examinations including chest, dental and orthopedic imaging and in localization of brachytherapy seeds. Digital tomosynthesis combines digital image capture and processing with simple tube and detector motion, as used in conventional radiographic tomography. Although there are some similarities to CT, it is a very different technique. In CT, the source and the detector make a complete 360-degree rotation around the patient, obtaining a complete set of data from which images may be reconstructed. In digital tomosynthesis, only small rotation angles (a few tens of degrees) with a small number of discrete exposures are used. This incomplete set of data can be digitally processed to yield images similar to conventional tomography, with a limited depth of field. However, because the image processing is digital, a series of slices at different depths and with different thicknesses can be reconstructed from the same acquisition, saving both time and radiation exposure. Because the data acquired is incomplete, tomosynthesis is unable to offer the extremely narrow slice widths that CT offers. However, higher-resolution detectors can be used, allowing very high in-plane (x, y) resolution, even if the Z-axis resolution is poor. Reconstruction algorithms for tomosynthesis are significantly different from those of conventional CT, because the conventional algorithm requires a complete set of data. Iterative algorithms are most commonly used, but are extremely computationally intensive. Digital tomosynthesis is comparable to geometric tomography. The difference is that in digital tomosynthesis, the X-ray tube makes one sweep and produces many slices, while with geometric tomography; each sweep produces only one slice. This is enabled by the rapid readout capabilities of flat panel digital detectors. A series of low-dose exposures are made during the sweep, which are reconstructed to produce slices at different planes within the patient. Tomosynthesis can provide resolution of 0.2-0.4 mm in the x- and y- planes. In the z- plane the resolution is 5 mm for chest and 1 mm for breast. Higher resolution in X- and y- planes than CT.
Dose-efficient compared to geometric tomography. As mentioned before, tomosynthesis is a method for producing images of slices through the body using a general radiographic X-ray system with a digital detector. While the technique has been known for many years, only recently has the imaging system and computer hardware reached the required level of performance. The range of examinations that might be undertaken using tomosynthesis is currently under investigation. Work is ongoing in many applications, including chest, orthopedics, abdomen and breast. Tomosynthesis is an optional add-on to equipment that provides planar digital images. 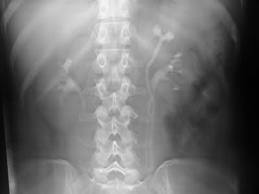 Planar images are still the most commonly undertaken imaging procedure in an X-ray department. In planar imaging, a patient is exposed to X-rays from one direction and the transmitted X-rays are detected on the other side of the patient, creating an image. One of the disadvantages of planar imaging is that organs and structures overlying the region of interest are superimposed on the image, which can make interpretation more difficult. Tomosynthesis overcomes this by reducing the visibility of superimposed anatomical clutter in the image. There are other techniques that are used to reduce this unwanted anatomical clutter, such as computed tomography and dual energy subtraction. CT produces image slices of the body, but it uses expensive, specialized equipment and is associated with high-radiation doses to the patient. Dual energy subtraction uses standard radiographic equipment and has shown some promise for chest imaging, although not all anatomical clutter is removed. The dose in chest tomosynthesis is about 0.1 mSv, 3 times more than digital radiography, but three times less than chest CT.
As with planar X-ray imaging, tomography uses the difference in attenuation between the tissues to form an image. However, while planar imaging acquires an image with the X-ray source and detector stationary, tomography uses a moving detector and source. They move with a center of rotation in the focal plane. Information above and below the focal plane is blurred out in the resulting image. Therefore, the image contains information predominantly in the focal plane. The height of the focal plane will depend on the height of the fulcrum. The thickness of the image slice will depend on the magnitude of the angle of the swing. The tube moves in a plane parallel to the detector plane and the detector may also move in its plane. This method is typically used in the chest and abdomen. Simplest reconstruction algorithm, maintains uniform magnification. The tube and detector are fixed rigidly in relation to each other and move in tandem in a circular path around the patient. Used in cone-beam CT, in C-arm imagers and radiation oncology to verify patient position. Can provide excellent reconstructions, but with a more complicated algorithm. The detector remains stationary, x-ray tube moves in an arc above the detector, used in breast tomosynthesis because of the ease of constructing a compact rotational gantry for the x-ray tube. Leads to variable magnification and different tube orientations and can therefore distort small structures, unless special care is taken in the back-projection process. Mammography- tomosynthesis for breast imaging has been widely discussed in various studies and literature. While the technical principles remain the same as for general radiography, a higher performance mammography detector must be used, and dose levels will be of particular importance in potential breast screening applications. Chest imaging- some research concludes that tomosynthesis showed improvement in image quality as compared with conventional tomography. An improvement of pulmonary module detection of tomosynthesis in recent years was noticed. One paper suggests that three times more pulmonary modules were found by tomosynthesis in comparison with the planar x-ray. Orthopedics- it was demonstrated that tomosynthesis had potential for imaging arthritis changes in the hands. Also, some improvement was found in the ability to visualize hip prostheses with tomosynthesis, and it was noted that tomosynthesis can avoid streak artifacts from metal objects, which can cause problems for CT images.